It felt as if I had walked into a dull replay of a JG Ballard short story. Tate Modern’s Turbine Hall is lined with bunk beds, the beds are scattered with science-fiction novels, and a screen at the far end of the hall plays excerpts from sci-fi and experimental films. I thought the work – TH.2058, by the French artist Dominique Gonzalez-Foerster – was rather feeble, to be honest. It includes a “mission statement” on the wall that creates the atmosphere of a futuristic refuge shelter much more effectively than the exhibition itself. I like to feel threatened by installation art. 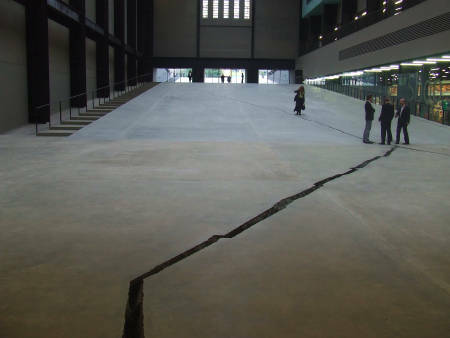 In the past, I’ve come out of Tate Modern shaking my fingers as if they’ve been burnt, but that wasn’t happening here. a word used as a test for detecting people from another district or country by their pronunciation; a word or a sound very difficult for foreigners to pronounce correctly. The Old Testament relates that the Ephraimites were trying to cross the river Jordan when they were caught by their sworn enemies the Gileadites, who forced them all to say the word “shibboleth”. Since the unfortunate Ephraimites’ dialect did not include the sound “sh”, this allowed the Gileadites to identify and slaughter large numbers of Ephraimites.